Pleasanton Partnerships in Education (PPIE) Foundation works in partnership with your PTA to provide an exceptional educational experience for your student. While PTA supports “stuff” (class materials, enrichment activities, some technology and parent/teacher development), PPIE funds supplemental STAFF and critical programs. 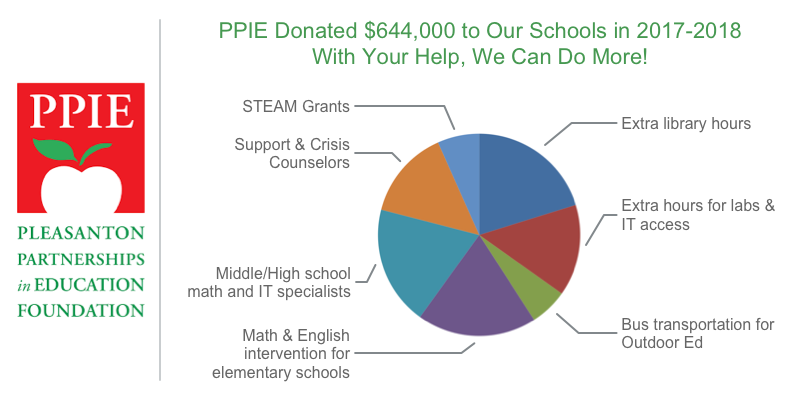 Donate to PPIE so Pleasanton Middle can continue and expand these benefits – and respond to our Fall Survey to guide what PPIE should fund in the future! We welcome ALL donations - $100 to $1,000 per student – and our goal is greater family participation! $500 is recommended (compared to $1,000 for many school foundations) and $1/day ($18/month with our 10 month payment plan) is highly welcome! PPIE offers benefits and recognition for all family donors (includes total family giving + matching funds) with Pleasanton Weekly and Annual Report notices.